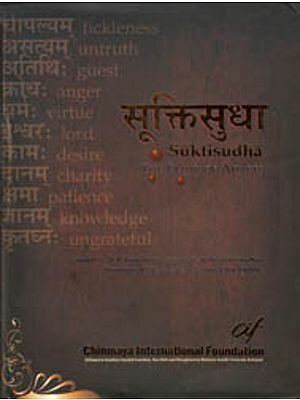 The Book of Treasure is a collection of sparkling Sanskrit sayings presented for the perusal of general readers who would like to appreciate the wit, humour, logic philosophy and many other fields of human thought preserved in concise form in the Vedas, Upanisads, Rarnaya na, Mahabharata, Puranas, Paficatantra, epics, dramas and other sources of Sanskrit literature. Authorship and source of most of these maxims are wellknown, still there is a good number of them which cannot be easily located. So the compiler has not taken the trouble of locating the source or authorship of these citations -which is really a problem for the scholars. 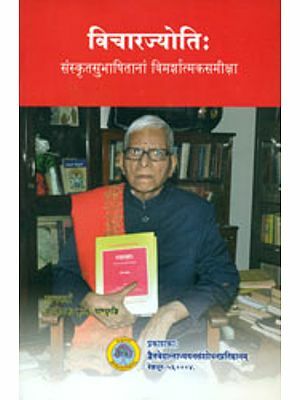 In Sanskrit literature, it had been a long-drawn academic tradition to prepare anthologies, and a good many dictionaries of quotations were compiled. Such quotable passages are known as su-ukii, su-bhiisiia or su-uacana i.e. witty sayings, which are expressed by various words in English such as aphorism, dictum, maxim, precept, adage, axiom, byword, epigram, proverb, etc. Many proverbs in various languages have become immortal due to their popularity, and for example a few may be cited: Thou shalt not be afraid, Man is mortal, Might is right, God is good, Love is blind (in English), Ars longa vita brevis, Veni vidi Vici (in Latin), Gnothi sauton in Greek meaning- Know thyself, Liberte, egalite fraternite (in Freanch meaning Liberty equality fraternity). The present collection being an anthology of the Vedic and classical Sanskrit hymns, verses and a few prose passages along with a number of Buddhist and Jain maxims (rendered into Sanskrit) as well as their English translation is perhaps the first of its kind, and, therefore, it is expected that the publication would receive a warm welcome both from professional scholars as well as general readers interested in appreciating the recorded thoughts of the superman-the poet- the seer, the scholar and the critic. As a general practice, quotations are usually classified subjectwise, and subjects are alphabetically arranged. But in this anthology, the compiler has devised some broad groups and some of these groups are interlinked due to their wide range. The present compiler has rather taken some sort of liberty in the arrangement of the proverbs in some broad classes and due to such arrangement a good number of passages may seem overlapping.
. Many remarkble ideas and concepts about virtues and vices, joys and sorrows, ups and downs, hope and despair, myths and realities, ethics and morality, art and culture have found their expression in these citations. Some of these are pure instructions, some give pure delight, some contain philosophical ideas in crude forms and some generate thought -provoking ideas for the intellectual and inquisitive readers. Since the present work is not an extensive collection, many quotable quotes may be lacking here. But the compiler has taken utmost care so that most common, popular and witty excerpts might find their place in this book. A proverb is one man's wit and all men's wisdom. The wise make proverbs and the fools repeat them. But there are some citations which are very much tough to digest. Let me quote one of them: Books are fatal: they are the curse of the human race. Nine-tenths of existing books are nonsense, and the clever books are the refutation of that nonsense. The greatest misfortune that ever befell man was the invention of printing.